When the new Parliament House was being built in Canberra in the early 1980s, graffiti appeared on the construction hoardings on Capital Hill reading: White Australia has a Black History. The Movement is part of that Black history. Since the erection of the first tent of the Aboriginal Embassy on the lawns opposite Old Parliament House in 1972, The Movement, through various strategies, has brought to national consciousness not only the land rights struggle, but a whole raft of cultural, political, social and economic issues. Juno Gemess recent exhibition of sixty-seven black-and-white mounted photographs and sixty-seven colour images on DVD at the National Portrait Gallery in Canberra documents some of the faces central to The Movement. Documentary photography is not a satisfactory term when applied to Gemess work. Her photographs only partially relate to this tradition and to the concept of a camera with a conscience. She assembles the photographic visual evidence in the form of an illustrated history. The title of the exhibition, Proof: Portraits from The Movement 19782003, also suggests that the artist intends the photographs to be read as evidence and documentation. However, what is presented is a very partisan insiders portrait of The Movement, where a sense of intimacy and empathy is established between the photographer and her subjects. When viewed as a sequence, we experience a curious sensation of being simultaneously inside The Movement, almost as participants, and outside it, as observers and sympathetic witnesses. In photographs such as Remembering Brian Syron, 1993, Gary Foley, Invasion Day  We have survived, 1988, or Kevin Gilbert and Joe outside Anti-Bicentennial and Treaty 88 meeting, 1987, there is an expression of both pride and defiance. The formal structure suggests a casual glance with the randomness of a snapshot in the compositional arrangements, but there is also a note of authority, an awareness that we are witnessing historically significant events. Other photographs are painstakingly deliberate, somewhat reminiscent of the immaculately constructed images of Dorothea Lange, rather than those of the more brutalist approach of Weegee (Arthur Fellig) and Lisette Model with whom Gemes is often compared. Gemes presents an unforgettabe gallery of some of the memorable figures in The Movement, such as Bill Reid  Elder, artist, 1979, shown standing at the ballot box, Kumatjay Perkins speaking out at the Roma Forum, 1982, as part of a demonstration connected with the land rights movement in Queensland, and the actor Ernie Dingo, shown in a wonderfully composed image with Cate Blanchett, photographed on the Heartland filmset in Brooklyn, New South Wales, in 1994. There is also a sense of inevitability in Gemess most successful photographs. She has the ability to capture the moment when her subject has found its complete resolution. Take, for example, the remarkable image Countrymen, 1978, showing elders from Aurukun, Mornington Island, greeting each other before a ceremony. The three elders, framed by a huge sprawling gum tree, have momentarily come together in an interwoven, emotionally charged embrace, yet are about to separate and launch into movement. By adopting a very low vantage point, reminiscent of Lisette Models, Gemes has given her image a monumental presence. Had the photograph been taken a moment before or a moment later, the wonderful tracery of energy which links the three figures would have dissipated. Rhonda Davis, in her catalogue essay, recounts how Gemes, after she had arrived in Australia with her family in 1949 as a five-year-old from her native Hungary, was shy of her imperfect command of English. For a year after her arrival she pretended to be a deaf-mute. During that year, I learned to read people by gesture, movement, body language and tone of voice.1 Throughout her photographs we experience this quality of an inner voice. Her selection of the moment of exposure corresponds precisely to the time when a subjects hand gestures, body language and eye movements are at their most expressive. While in some photographic exhibitions we experience a hushed silence, like in a church ceremony, or an amazement at the photographers technical virtuosity, Gemess photographic essay, in contrast, appears like a noisy corroboree, where the colourful characters  the leaders, heroes and entertainers  are all determined to have their say and to engage us with their presence. While Gemes documents some of the main players and events associated with the Aboriginal cause over the past three decades, she allows her images to speak for themselves without resorting to technical tricks or clever encoded narratives. 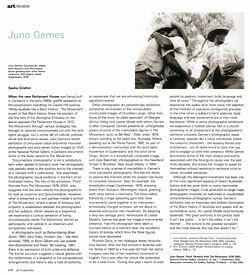 1 Juno Gemes, quoted in Rhonda Davis, Incontra personale, Proof: Portraits from The Movement 19782003, exhibition catalogue, National Portrait Gallery, Canberra, 2003, p. 17. 2 Ann Thomas, Lisette Model, National Gallery of Canada, Ottawa, 1990, p. 115. © Sasha Grishin. Reprinted with kind permission of Art & Australia.